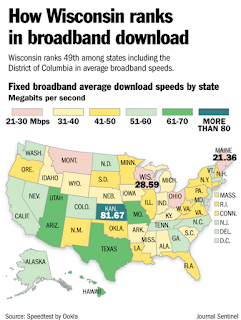 DemoCurmudgeon: Walker's Wisconsin 49th in internet speed, and moving forward? Walker's Wisconsin 49th in internet speed, and moving forward? 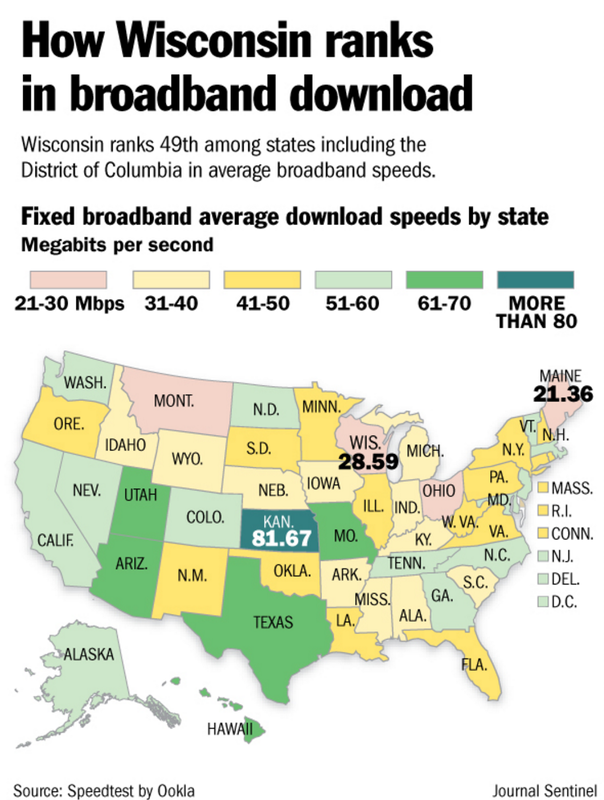 "Wisconsin lags behind other states in internet speeds, a new report shows, although gains have been made..."
Wisconsin ranks 49th among states and the District of Columbia in the average download internet speed for a wired connection, according to the report from Speedtest, a Seattle technology firm. Well thank you Scott Walker, for all that you've done leaving it up to the free market that decided to do nothing without taxpayer handouts. The 28.59 megabits per second is still more than adequate for most internet users watching a movie on Netflix or telecommuting. The state is turning down $23 million because state taxpayers would have been on the hook for the entire amount if the state could not meet the grant's precise requirements, Mike Huebsch, secretary of the state Department of Administration, said. In 2015, Governor Walker and the Wisconsin Legislature tripled the amount of funding for broadband expansion grants to $1.5 million annually, with a total of $6 million allocated from the Universal Service Fund cash reserves to fund grants over a four-year period ... the program’s $1.5 million combines with local and private matching funds. Monday, backers of a proposed municipal broadband service in Madison released a report that showed the service could cost more than $200 million. If the plan is successful, Madison would become the largest Wisconsin city to have a municipal broadband service, competing with commercial internet providers. Minnesota, by comparison, spent about $20 million on matching grants in 2014 and $10 million last year. Just last month, Gov. Mark Dayton asked lawmakers to approve $100 million of the state’s $1.2 billion surplus for broadband grants during the upcoming legislative session. Thanks, absolutely one of the other bigger mistakes by Walker. Thanks for the link as well. In case the one you provided didn't work, here's another. What is this 'surplus' that Minnesota has. Being from Wisconsin I wonder if that Norwegiuan for defecit?